water-soluble, virtually unpolymerized phenol-formaldehyde mix. plasticity at polymerization temperatures, prior to the setting of the resin. 400 pounds per square inch, to be compressed to half the original thickness. pressed to half their original thickness under any pressure. gravities of 1.3 to 1.4.
resin has been procured by the application of heat alone, without compression. trLated compressed plies are combined with untreated plies. treated wood to about 1.4 can be obtained. for this purpose. Slightly less than normal spread is sufficient. ordinary wood only after removing the surface glaze by sanding or machining. to avoid locally thick glue lines. most satisfactory and have been most extensively used3. moisture content as is practical, that is, about 2 percent moisture content. serious when the moisture content of the veneer is appreciable. Horace T:. Burr, Assistant Chemist and Alfred J. Stammn, Principal Chemist. -See Forest Products Laboratory Mimeo. Fo. 1346, "Gluing of Thin Compreg,"
as cottonwood, aspen, _Lnd yellow-poplar. internal temperature is built up more rapidly than by conduction alone. for avoiding temperatures appreciably above 285 F.
minutes to cool the panels to 200 F. at the center subsequent to curing. cured in about 20 minutes and at 3000 F. in about 10 minutes. bring the wood to the polmerization temperature should be markedly reduced. l'o data are as yet available on curing times by this method. by using high frequency heating. of the surface, and washboarding of the surface in woods with contrasty grain. compreg made at moisture contents beliw 2 percent. amount of fiber substance per unit dimension is increased. thickness when subjected to a relative humidity of 97 percent for 44 dO . days, 3.7 percent after 30 days, and 5.4 percent after 60 days. absorb less than 1 percent moisture under these conditions. barrier than the uncompressed rcsin-treated wood (sec minAeo 1380). T1-. finish when scratched or marred by merely sandi.-., and buffing. gave a value of 18.
but on the controls showed an obvious need for building up the finish. can be considered only as approximate properties. during the early portion of th., test. This specimen is substandard, in. long to provide a -,ore favorable filler radius. over a 1/2-inch *".-ie length were taken iuring- the early portion of the test. with a rate of descent of the movable head of 0.018 inch per minute. thickness or width was approximately 0.35 inch instead of 2 inches. 1/2 inch deep cut fro'-, another sfi.cimen 1 inch thick. the grain and across the plies, by the Forest Products Laboratory method. were 4,000, 4,500, and 3,7C0 pounds per square inch. shear-test method for normal wood when shearing in the plane of the plies. ed., John Wiley & Sons, 1930, p. 61.
pression and at right angles to the direction caused by the compression. compression and 1,500 pounds at right angles to the direction of compression. sometimes occurs, indicating that the bond may not be as strong as the wood. laminated sweetgum, 100 percent wood failure is obtained in the shear tests. inch, and complete wood failure resulted. practically unaffected by curing conditions above a minimum threshold value-. cure causing a decrease in toughness. 1. M. Seborg. and A. J. Stamrm. lower tool s-. ':-ds than for nor-w,.! wood are desirable. for moldin-: prc-carved blanks rath. r than carving the final compr,-- blanks. flash that can be readily machined off normally occurs at the parting line. temperature, just as were the blanks for the molded airplane propellers. and preciuri uncompressed core show promise for skin coveri--s of ai-r3irnes. promise for postwar use in house paneling, siding, and flooring. Camfield Hanufacturing Co., Grand Haven, Mich.
Farley-Loetscher Manufacturing Co., Dubuque, Iowa. Formica Insulation Co., Cincinnati, Ohio. Panelyte Division, St. Regis Paper Co., Trenton, N. J. The Rudolph Wurlitzer Co., DeXalb, Ill.
i- material is at present available only for war use. R. 1. Seborg. Forest Products Laborat-r;,. ,1i.eograp.P El12Y(. 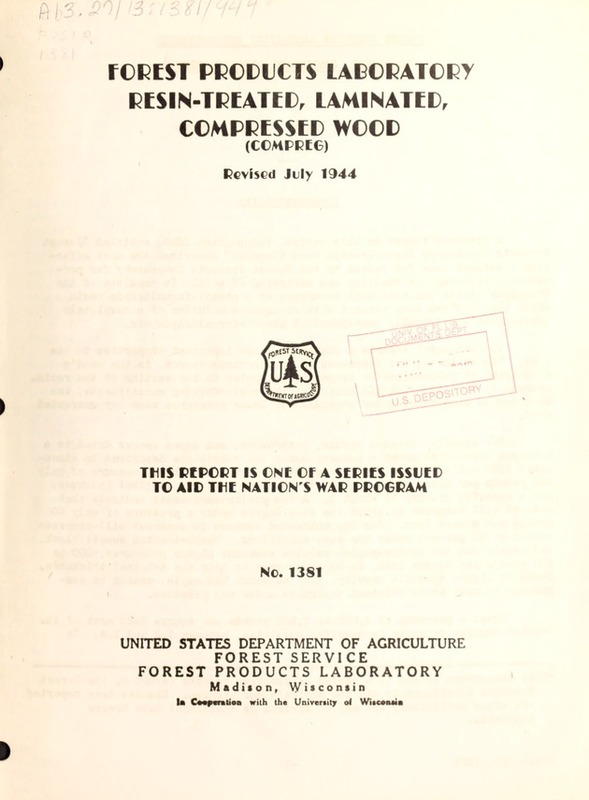 ritucky, October, 1941, Forest Products Laboratory iimeogrprh 1.7-3.
r--nC ci f -- t- :i ~. Joson sin, Ile shear Liethod..
Johi-r'in double she, r ,.ethod..